For other people named Joseph O'Connor, see Joseph O'Connor (disambiguation). Joseph Victor O'Connor is an Irish novelist. He is known for his 2002 historical novel Star of the Sea. Before success as an author he was a journalist with the Sunday Tribune newspaper and Esquire magazine. He is a regular contributor to Raidió Teilifís Éireann (RTÉ). He is a member of the Irish artists' association Aosdána. Eldest of five children and brother of singer Sinéad O'Connor, he is from the Glenageary area of south Dublin. His parents are Sean O'Connor, a structural engineer later turned barrister, and Marie O'Connor. Educated at Blackrock College, O'Connor graduated from University College Dublin with an M.A. in Anglo-Irish Literature. He did post-graduate work at Oxford University and received a second M.A. from Leeds Metropolitan University's Northern School of Film and Television in screenwriting. In the late 1980s he worked for the British Nicaragua Solidarity Campaign; his second novel, Desperadoes, drew on his experiences in revolutionary Nicaragua. His novel Cowboys and Indians (1991) was on the shortlist for the Whitbread Prize. On 10 February 1985 O'Connor's mother was killed in a car accident. He had the mother of the character Sweeney in The Salesman (1998) die in such a manner. In 2002, he wrote the novel Star of the Sea, which The Economist listed as one of the top books of 2003. His most recent novel, Ghost Light is loosely based on the life of the actress Maire O'Neill, born Mary "Molly" Allgood, and her relationship with the Irish playwright John Millington Synge. It was published by Harvill Secker of London in 2010. O'Connor has been a Research Fellow at the New York Public Library and Visiting Professor of Creative Writing/Writer in Residence at Baruch College, the City University of New York. In 2014 he was announced as the inaugural Frank McCourt Chair in Creative Writing at the University of Limerick, where he teaches on the MA in Creative Writing. He was a regular contributor to Drivetime, an evening news and current affairs programme on RTÉ Radio 1. 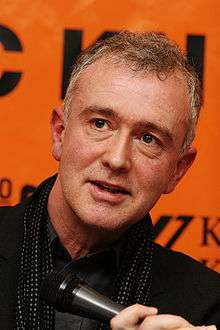 O'Connor is married to the television and film writer, Anne-Marie Casey. They have two sons. He and his family have lived in London and Dublin, and from time to time in Manhattan during his work in New York City. My Cousin Rachel - stage adaptation of the Daphne du Maurier novel. 2012 Irish PEN Award, for outstanding contribution to Irish Literature. ↑ "Read Ireland – Featured Authors". Readireland.ie. Retrieved 2011-05-21. ↑ "O'Connor one of five new Aosdána members". The Irish Times. Irish Times Trust. ↑ "Glenageary roots". Southcountydublin.forumforus.com. Retrieved 2010-05-04. ↑ Ciarán Byrne (February 27, 2010). "The late Eugene Lambert – neighbour and artist from south Dublin". Irish Independent. Retrieved June 9, 2012. 1 2 "About Joseph O'Connor". Josephoconnorauthor.com. 1963-09-20. Retrieved 2011-05-21. ↑ "Ghost Light by Joseph O'Connor". Josephoconnorauthor.com. Retrieved 2011-05-21. ↑ "Joseph O'Connor appointed to chair in creative writing at University of Limerick". Irish Times. 20 February 2014. Retrieved 11 December 2015. ↑ "Reasons to be cheerful: Joe O'Connor sees good in the recession". Tribune.ie. 2008-07-20. Retrieved 2010-05-04. ↑ "Review of "Star of the Sea"". Mostlyfiction.com. Retrieved 2010-05-04. ↑ "Walter Scott historical fiction shortlist announced". BBC news. 1 April 2011. Retrieved 12 Jun 2011. ↑ "O'Connor to receive Irish PEN Award". RTÉ Ten. 29 November 2011. Retrieved 29 November 2011.